Product information "AKAI Professional SynthStation49"
The AKAI Professional SynthStation 49 is the most intuitive, advanced music controller designed specifically for use with iPad. Fully certified to work with the original iPad, iPad 2 and iPad (3rd generation), this Workstation comes equipped with a fitted dock, fully integrating iPad’s touchscreen into the control surface. The AKAI Professional SynthStation49 works seamlessly with the heralded SynthStation app by AKAI Professional. Like this, the controller provides unparalleled music creation capabilities, including direct in-app MIDI recording. In addition to its integration with the SynthStation app, the AKAI Professional SynthStation49 is also completely iOS Core MIDI-compatible, making it instantly compatible with dozens of music apps already available in the App Store with hundreds more on the way. The expansive physical controls perfectly complete the powerful capabilities of the SynthStation app. 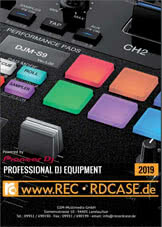 Responsive keys, rubberized pitch and modulation wheels and MPC-style drum pads all bridge the gap between the virtual world and the real world, creating a powerful and seamless music-making experience. The nine MPC-style drum pads of the AKAI Professional SynthStation49 deliver intuitive control for the 50-plus classic and modern kits available within the SynthStation app. Program, Sequence, Song select and Transport buttons also provide quick navigation to the most used features of the SynthStation App for a seamless, efficient workflow. By using the USB MIDI port of the AKAI Professional SynthStation49, you are able to dock, power and position your iPad perfectly using the adjustable cradle or establish commanding control over your favorite computer software. The port can be connected directly to your Mac or PC, allowing the controller to receive power and transmit MIDI to and from your music software — this is a great way to turn the SynthStation app or any other Core MIDI-compatible app into a sound module. 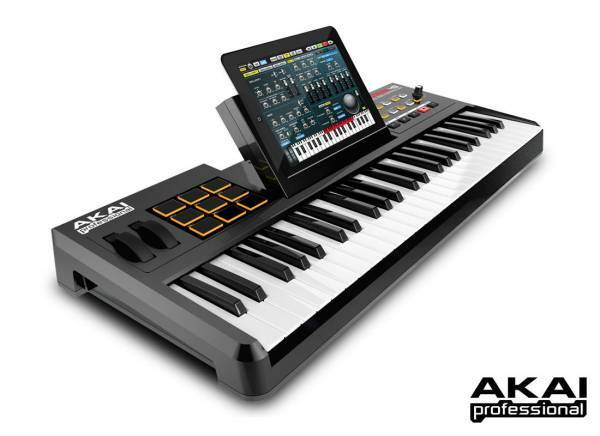 You can even use the AKAI Professional SynthStation49 as a traditional USB MIDI controller with your computer—no iPad required. Be the first who writes a review for: "AKAI Professional SynthStation49"